The aim of these workflows is to provide the statistical tools to analyze the taxonomic and functional make-up of metagenomic data in a rigorous ecological framework, and to provide insights into community ecology beyond purely descriptive studies. The Microbial Metagenomic Trait Statistical Analysis workflow calculates a number of ecologically interesting traits of bacterial communities as observed by high throughput metagenomic DNA sequencing. These metagenomic traits workflows are significant, as it is very likely that environmental sequencing in natural and disturbed habitats will become a routing part of monitoring programs. This workflow can be accessed through the BioVeL Portal here. The BioMaS (Bioinformatic analysis of Metagenomic AmpliconS) workflow has been designed for the taxonomic profiling of environmental microbial communities through target-oriented metagenomic surveys. It includes all the computational processing steps from raw Next Generation Sequencing (NGS) data input and cleaning to the final taxonomic identification and representation. In its current version, BioMaS allows the analysis of both bacterial and fungal environments starting directly from the output of 454 and Illumina NGS platforms. Input data for the Microbial Metagenomic Trait Statistical Analysis workflow: microbial metagenomic DNA sequence data. Input data for the BioMaS workflow: microbial target-oriented metagenomic DNA sequence data generated by NGS platforms. The Microbial Metagenomic Trait Statistical Analysis workflow allows standardized, repeatable, and comparable utilization of metagenomic data while hiding the complexity of analytical procedures behind well-defined web services. The workflow computes the multivariate statistics related to the metagenomic community traits outlined in "Barberan et al. (2012). Exploration of community traits as ecological markers in microbial metagenomes. DOI: 10.1111/j.1365-294X.2011.05383.x)." 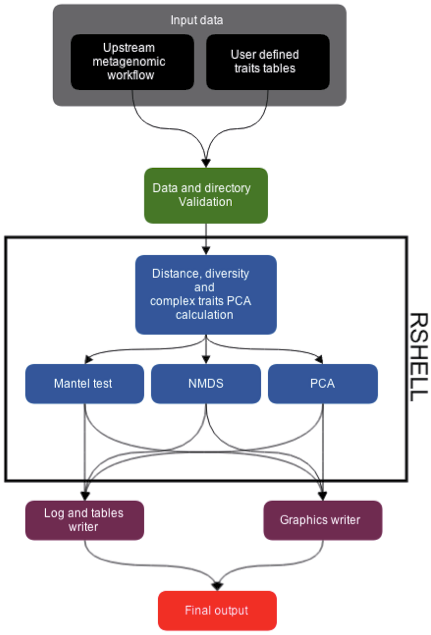 The traits included in the statistical analyses range from GC-content to functional diversity, and deliver a valuable set of ecological markers in order to discriminate between habitats or geographic locations. Furthermore, inter-trait relationships can be used as habitat descriptors or indicators of artifacts during sample processing. Overall, these metagenomics community traits approach, here combined in a single workflow, helps to interpret metagenomics data to gain a full understanding of microbial community patterns in a rigorous ecological framework. BioMaS includes the following consecutively and automatically running modules: 1) statistical and quality evaluation of raw data and arrangement for the next analysis steps, 2) mapping of sequence data on reference databases and parsing of resulting hits, and 3) taxonomical binning and assignment. The easiest way to execute the workflow is by running it on the BioVeL portal, where everything is already configured for its execution. Nonetheless, the user can load and execute the workflow locally in Taverna Workbench (v2.5) if desired. When it is run in Taverna Workbench, the workflow requires a local Rserve installation running on port 6311 with the following R packages: ape, MASS, ggplot2 and RColorBrewer. It is also possible to setup the workflow to use a remote Rserve.